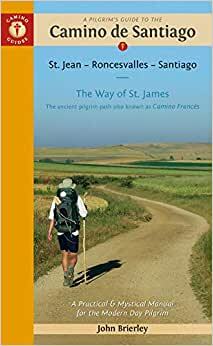 Now updated to include newer maps and photos, with height reduced by 20mm to make it even lighter in weight to support carefree traveling, this comprehensive guidebook to the Camino de Santiago and its offshoots contains all the information needed by modern-day pilgrims wishing to walk the sacred Way of St. James. Overview route planners plus daily stage maps and detailed town plans help sojourners with all the advance preparation they need. The maps feature contour guides to help distinguish the terrain that will be crossed each day, while full information on all pilgrim hostels, as well as details for alternative accommodation, allow travelers to plot adequate nightly stopping points. All reference information is accompanied by helpful spiritual guidelines to support the seeker's inner journey as well as the outer pilgrimage. Otherwise known as the Camino Francés, the main route covered in this volume is the most popular sacred route through Spain, from St. Jean Pied de Port to Santiago. I hiked just over half of the Camino Francés in 2014 and returned in 2015 to do the Camino from Saint-Jean-PIed-de-Port all the way to Sarría, just short of Santiago. On both occasions, this is the book that almost all of the English speakers on the Camino were carrying. (My 2015 Camino trek is described in the book A Senior Citizen Walks the Camino de Santiago). However, this review is about Brierley's book, which describes each suggested stage in detail and includes maps, elevation charts, a description of most hostels along the way, and brief descriptions of the cultural background and the history of many places of interest along the Camino. I think there is a general agreement among pilgrims on the Camino that his is the book to carry. It is a bit pricey, but considering the trove of information it contains, it is worth it. There is no need to stick to Brierley's suggested stages to use the book. I found many of the smaller villages along the way to be interesting places to stay, and I only occasionally finished a day's stage at the town or city that Brierley suggested, but even so, I relied on the book to help me find alternative lodging. Why am I only giving it four stars if it's such a great book? Because on the Camino, when one is hiking day after day and week after week, every extra ounce in the backpack begins to add up. Many people hiking the Camino start looking for objects in their backpacks that they can leave behind or ship ahead to lighten their packs sometime during the second week. This book has a bit of heft despite its small format. Some people tear out pages as they progress along the Camino to lighten the load, although this is a book that I decided to keep in its dog-eared entirety to refer to in future years. I would give the book five stars if it were offered in Kindle format. When I hiked the Camino, I had dozens of books loaded on the Kindle app on my tablet computer to read in the evenings while sipping a beer and resting after a hard day's hiking. However, this is the only printed book that I carried. If you are heading back to the 1980s to walk the Camino, purchase this book by all means. There are many apps that are far superior to this book. Does this book allow you to email albergues from it? No. How about call them? No. Real time reviews by pilgrims( bedbugs, clean bathrooms, meal quality)? No. Maps that link to gps to show you exactly where you are when confused? No. So, why buy this preachy relic of a lost age? Get it from your library and plan your Camino to avoid the Brierly crowds and then return it. 5 mins of searching will find you superb apps that work offline and have all the conveniences that modern travelers demand. John, please, make an app! You are the camino info king and should be able to produce something that will change the way people walk the camino for generations to come! 5.0 out of 5 starsInvaluable! Having obtained several other books on the Camino I found this book just what I wanted. It was updated for 2016, is comprehensive and the maps are great. Nice small size. I liked that the author provided all the practical information a pilgrim would need as well as some very nice thoughtful and reflective sections . John Brierley's guides to the Camino are by far the best I have encountered. I tested about six other guides when I first ventured on the Camino Frances in 2010, and found no rival for Mr. Brierley's book. Since then I have used his "Camino Portugues" guide in 2011, the "Camino Finesterre" guide in 2012, and again the "Camino Frances" in 2013. By then the 2010 edition had proved quite outdated, particularly with respect to lodgings information, and I welcome the new updated 2015 edition, which I am going to use in my planned 2015 or 2016 trip. The slightly more compact size and the additional individual town maps will surely make it even handier. His placing the " Route de Napoleon" as the recommended route for crossing the Pyrenees on the first day from St. Jean Pied de Port. The authentic pilgrims route had always been the Valcarlos/Arneguy route with its connections with the Charlemagne saga and its numerous villages are well equipped to cater to the needs of pilgrims. The "Route de Napoleon", on the other hand, has only one 18 bed albergue, and what is worse - is extremely steep and dangerous, particularly in poor weather. While I was walking the Valcarlos route in September of 2013, a woman fell to her death from a precipice on the Napoleon Route, and two other ladies almost did the same. So beware! Otherwise, as I have stated above, Brierley's guide is the best Camino guide a pilgrim could wish for. This is a wonderful book but two caveats. First, skip Larrasoana which the book recommends. The albergue is small and the facilities are bad. The word on the street is that either the author or publishers have a connection to the albergue. Second, if you follow the start and stop recommendations you will find yourself out of an albergue unless you are a quick walker. Nearly everyone is carrying this book and following the recommendations. There are just not enough albergues (or other places to stay) to hold this many people, even in the off season.